conjugated to KLH, corresponding to amino acids 1-14 of Xenopus laevis Actin (beta). 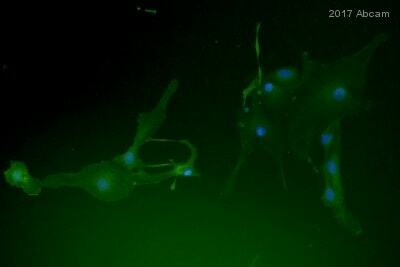 Cultured human or chicken fibroblasts. Molecular weight of beta actin is 42Kd. Immunofluoresence staining of chicken gizzard ultra-thin sections labels the dense bodies, longitudinal channels and membrane associated dense-plaque. Our Abpromise guarantee covers the use of ab6277 in the following tested applications. ab6277 at 1/100 dilution staining beta Actin in rat brain endothelial cells by Immunofluorescence. Immunocytochemistry/ Immunofluorescence analysis of chicken fibroblast cells labeling beta Actin with ab6277 at 1/300 dilution. The cells were fixed and permeabilized with cold methanol followed by cold acetone. 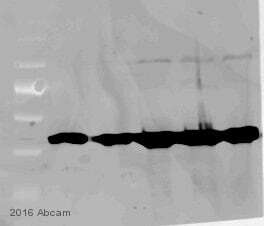 Fixed cells were stained with 1/300 Anti-beta Actin antibody [AC-15] (FITC) (ab6277).